Posted November 10th, 2014 by admin. The redesigned SAT Prep will take effect in spring 2016. It has introduced major design changes to better reflect students’ performance in college and professional careers. According to the College Board, the redesigned SAT has key content changes in the following eight major areas. The redesigned SAT Prep will focus on relevant words, the meanings of which depend on how they’re used. Students will be asked to interpret the meaning of words based on the context of the passage in which they appear. This is demanding but rewarding work. These are words that students will use throughout their lives — in high school, college, and beyond. Requiring students to master relevant vocabulary will change the way they prepare for the exam. No longer will students use flashcards to memorize obscure words, only to forget them the minute they put their test pencils down. The redesigned SAT will engage students in close reading and honor the best work of the classroom. When students take the Evidence-Based Reading and Writing and Essay sections of the redesigned SAT, they’ll be asked to demonstrate their ability to interpret, synthesize, and use evidence found in a wide range of sources. These include informational graphics and multiparagraph passages excerpted from literature and literary nonfiction; texts in the humanities, science, history, and social studies; and career-related sources. For every passage students read in the SAT Reading Test, there will be at least one question asking them to select a quote from the text that best supports the answer they have chosen in response to the preceding question. Some passages will be paired with informational graphics, and students will be asked to integrate the information conveyed through each in order to find the best answer. Questions in the SAT Writing and Language Test will also focus on command of evidence. Students will be asked to analyze sequences of paragraphs to make sure they are correct, grammatically and substantively. In some questions, students will be asked to interpret graphics and edit the accompanying passages so that they accurately convey the information in the graphics. The Essay will also require students to demonstrate command of evidence. Students will be asked to analyze a provided source text to determine how the author builds an argument to persuade an audience through the use of evidence, reasoning, and/or stylistic and persuasive devices and then to write a cogent and clear analysis supported by critical reasoning and evidence drawn from the source. 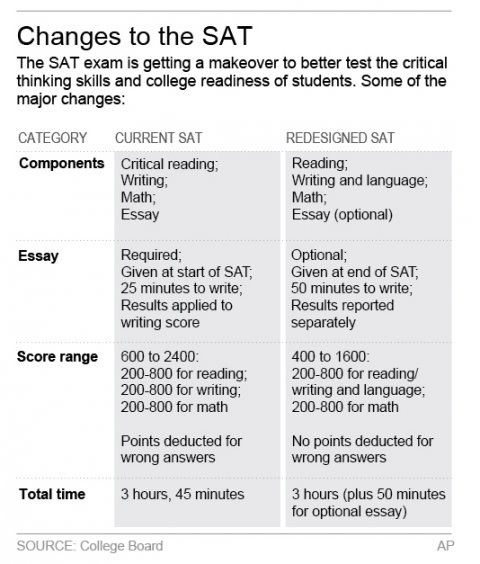 The focus of the Essay section on the redesigned SAT will be very different from the essay on the current SAT. Students will read a passage and explain how the author builds an argument to persuade an audience. Students may analyze such aspects of the passage as the author’s use of evidence, reasoning, and stylistic and persuasive elements. This task more closely mirrors college writing assignments. The new Essay section is designed to support high school students and teachers as they cultivate close reading, careful analysis, and clear writing. It will promote the practice of reading a wide variety of arguments and analyzing how authors do their work as writers. The essay prompt will be shared in advance and remain consistent. Only the source material (passage) will change. The Essay will be an optional component of the SAT, although some school districts and colleges will require it. The exam will focus in depth on three essential areas of math: Problem Solving and Data Analysis, the Heart of Algebra, and Passport to Advanced Math. Problem Solving and Data Analysis is about being quantitatively literate. It includes using ratios, percentages, and proportional reasoning to solve problems in science, social science, and career contexts. The Heart of Algebra focuses on the mastery of linear equations and systems, which helps students develop key powers of abstraction. Passport to Advanced Math focuses on the student’s familiarity with more complex equations and the manipulation they require. Current research shows that these areas most contribute to readiness for college and career training. They’re used disproportionately in a wide range of majors and careers. In addition to these areas, the exam will sample additional topics in math, including the kinds of geometric and trigonometric skills that are most relevant to college and careers.. Throughout the redesigned SAT, students will engage with questions grounded in the real world, questions directly related to the work performed in college and career. In the Evidence-Based Reading and Writing section, reading questions will include literature and literary nonfiction, but also feature charts, graphs, and passages like the ones students are likely to encounter in science, social science, and other majors and careers. Students will be asked to do more than correct errors; they’ll edit and revise to improve texts from the humanities, history, social science, and career contexts. The Math section will feature multistep applications to solve problems in science, social science, career scenarios, and other real-life contexts. Students will be presented with a scenario and then asked several questions about it. This allows students to dig into a situation and think about it, then model it mathematically. When students take the redesigned SAT, they will be asked to apply their reading, writing, language, and math skills to answer questions in science, history, and social studies contexts. They will use these skills — in college, in their jobs, and in their lives — to make sense of recent discoveries, political developments, global events, and health and environmental issues. Students will encounter challenging texts and informational graphics that pertain to issues and topics like these in the Evidence-Based Reading and Writing section and the Math section. Questions will require them to read and comprehend texts, revise texts to be consistent with data presented in graphics, synthesize information presented through texts and graphics, and solve problems based in science and social science. The table below provides the comparison of the current SAT and redesigned SAT. For more information about test registration and test dates, please visit http://www.collegeboard.org. 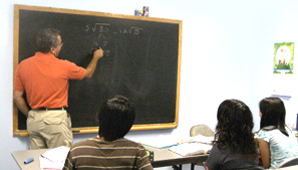 We offer SAT II classes in Math, Biology, Chemistry, and Physics. Most universities with a high academic admission standard require students to take at least three SAT II subject tests. Usually, Math is recommended plus two more subject tests in the area of students’ interest. We offer instructor-led English classes emphasizing reading, writing, grammar, and vocabulary. This program covers grades 1st – 10th grades. We offer instructor-led Math classes for grades 6th and up. Subjects include Pre-Algebra, Algebra, Geometry, Algebra II, Pre-calculus, and calculus. A step-by-step self-learning program designed to improve the students’ basic Math skills. Prior to enrollment, each student must take a computer based comprehensive diagnostic test to determine the problem areas and to develop and individualized program for the student. We offer after-school program for all five working days (Mon-Fri) from 4:00 pm – 7:00 pm. Included in the program are Enopi Math, English class, and homework help. 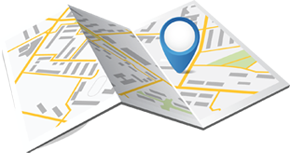 We offer private and semi-private tutoring for students with specific needs. A special group tutoring can be arranged on a demand basis.